Included below are homes for sale in Ocean Beach. If you would like more information on any of these Ocean Beach real estate listings, just click the "Request More Information" button when viewing the details of that property. We can provide you with disclosures, past sales history, dates and prices of homes recently sold nearby, and more. And, if you haven't already, be sure to register for a free account so that you can receive email alerts whenever new Ocean Beach houses come on the market. Ocean Beach was named Mussel Beach when it was first established in the late 1800s due to the availability of Mussels there. Since then, the area has gone through many changes yet much of the history has been carefully preserved with many historical landmarks and century old homes and businesses still in use today. It’s only seven minutes from downtown, has a colorful tapestry of residents, and is a unique beach town. Since 1887 Mussel Beach has been named Ocean Beach but residents refer to it simply as OB. For such a hip and eclectic population, this enchanting beach town is steeped in a rich wonderland of history. In fact the word Wonderland itself is part of the history of OB. In the early 20th century there used to be a giant amusement park called Wonderland in Ocean Beach. The developers who built the theme park were trying to reinvigorate the declining population of OB by turning it into a seaside resort town. Wonderland was to be the main attraction. Little did they realize putting a giant Ferris wheel on the beach was a bad idea. It eventually drifted out into the sea. Another amusement park further north further signaled the end of Wonderland but the name still lives on in many of the businesses currently operating in Ocean Beach like the Wonderland Ocean Pub on Santa Monica Ave. There are dozens of early homes built between 1887 when Ocean Beach was officially named all the way to the years of the Great Depression in 1931. Those homes are still standing and serve as a living history of the area. The first Ocean Beach library is still operational and is also a historical landmark as is the famous Strand Theater. Ocean Beach is part of the San Diego Unified School District thought it does have its own public elementary school and one K-8 private school. The public school, Ocean Beach Elementary, is very highly rated achieving a 9 on a scale of 10 from Greatschools.org. There are only 347 students in the school but the student body is wonderfully diverse where Blacks, Whites, and bi-racial students and students of different nationalities play and learn together. The private Warren-Walker School has a bigger student body but an incredible 5 to 1 student teacher ratio. It too can boast of its diversity with most of its students being White, Asian, and Pacific Islander. Of course surfing is probably the most popular Ocean Beach recreation. A little known fact is that Ocean Beach played host to the World Championships as far back as 1966. Still there is so much more to see and do in OB. The local rec center has multiple sports fields and courts that are open to the public. There are a number of public skate parks. And the pier is a great spot to catch a fish or play on the surf with man’s best friend. OB may be one of the most dog friendly neighborhoods in San Diego. They even have a stretch of beach affectionately known as “Dog Beach” because of the number of dogs there. Year round events bring locals and people all around San Diego to enjoy the annual Street Fair, the Jazz Festival, or to participate in a Chili Cook-off in the summer. 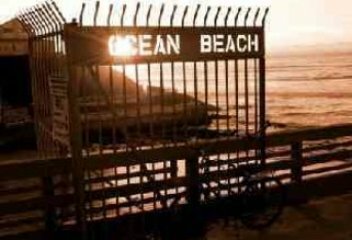 Ocean Beach is located at the southern tip of San Diego just north of Point Loma and south of Mission Beach. The town was built right on the shores of the Pacific where the 8 ends and the Pacific Ocean begins. Prior to the construction of the 8 freeway in 1967 Ocean Beach was cut off from the rest of San Diego. A bridge built in 1915 to join OB with Mission Beach worked to create a residential community there but once it was torn down in 1951, it once again was cut off from greater San Diego. Before cars were commonplace, it took a full two hours to reach downtown San Diego from Ocean Beach. Today it is a quick seven mile, ten minute drive up the 5 to get to downtown San Diego. Because it was built as a resort town, the older homes in the residential areas are in the style of ocean side bungalows and seaside cottages. Still you will find a variety of modern home styles including condos, apartment buildings, and many single-family homes. The people of OB are quite unique. Many proudly call themselves hippies and live the lifestyle. One of the first organic markets was established in Ocean Beach back in the 60s. The community has fought big business for decades in order to keep the many treasured local businesses alive. Some battles won, some lost, but the passion typifies this rare neighborhood. Only in OB will you find a pack of wild parrots dive-bombing the neighborhood on a daily basis. The Antiques District is a must see and you will find countless eating options at funky hole-in-the-wall establishments favored by the locals in Ocean Beach.